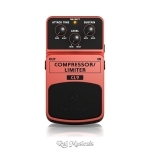 Behringer CL9 COMPRESSOR/LIMITER Effects Pedal - Whether it’s a million-dollar hook or a soul-wrenching solo, some licks are just begging for some undivided attention from the COMPRESSOR/ LIMITER CL9. Twist the Level knob to determine this pedal’s overall output, adjust the Attack to give the front-end of every strum and pluck added definition, then dial in the amount of sustain desired. The status LED tells you when the CL9 is on, and the high-quality on/off switch maintains incredible signal integrity in bypass mode.